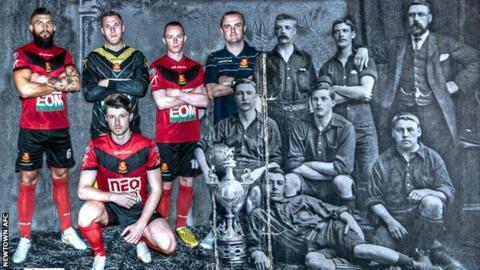 Welsh Cup final: Can Newtown end their 120-year wait for victory? Queen Victoria was two years short of her Diamond Jubilee, the Earl of Rosebery was British Prime Minister and Aston Villa lifted the FA Cup. The year was 1895 and Newtown FC won the Welsh Cup with a 3-2 victory over Wrexham in Welshpool - and they haven't won it since. They have only reached the final on one other occasion in the 120 intervening years. Parallels can be drawn with the Welsh Cup and English FA Cup finals of 1895 and 2015, with Newtown and Aston Villa having reached the finals of their respective competition this season. Both sides will also be underdogs in those finals, with Villa facing Arsenal on 30 May and Newtown up against treble-chasing The New Saints this Saturday. Newtown manager Chris Hughes is well aware of the history attached to Saturday's game and his side's achievements this season. "To reach the final is fantastic," said Hughes, who succeeded Bernard McNally as Robins manager in November 2013. "It's a big occasion for the club and everyone's been looking forward to it since we beat Rhyl in the semi-final. "There's a great buzz about the place, not just for the players and the management team but also for the volunteers who work hard behind the scenes. "We're all in it together and it's a real community club." Newtown, who also won the Cup in 1879 and have finished runners-up four times, will face a New Saints side hoping to complete a domestic treble for the first time in their history. Craig Harrison's side won the Word League Cup in January before securing their ninth Welsh Premier League title in early March. Saints lost only once during the league campaign and Hughes accepts his side go into the game as underdogs even though they have home advantage. Held usually at a neutral venue, this year's final will be held at Newtown's Latham Park following discussions between the two clubs and the Football Association of Wales. "Everyone expects TNS to win. They're favourites for a reason," Hughes added. "We know it's going to be difficult and we know they're a very good team. "But we've got belief in our dressing room and the confidence within our players is that we can cause an upset. "We beat them last season and have had some close games against them this season. "We feel we were unfortunate in at least two of the games not to have beaten them. "There's always shocks in cups and we're hoping there will be one on Saturday." Hughes has already been involved in a Welsh Cup-winning campaign during his time as Prestatyn Town assistant manager. Prestatyn caused something of an upset when they beat Welsh Cup specialists Bangor City in the 2013 final. "It was a fantastic day but a day fraught with anxiety and tension and I'm sure Saturday will be the same," Hughes recalls of the Seasiders' 3-1 win. "The biggest thing I can take from that day is how relaxed the players at Prestatyn were because we knew we had prepared well beforehand and we knew everything would take care of itself. "That's what we've tried to do this week with the players at Newtown. "We'll prepare right and make sure we cover every base and we'll turn up Saturday and hopefully produce a performance that will win the game."